Acquired: Selected in the fifth round (41st overall) in the 2017 CFL Draft. Contract extended Feb 1, 2019. 2018: In 16 games (16 starts), Boateng has recorded 26 tackles and nine quarterback sacks. Boateng also has one kickoff return for nine yards. 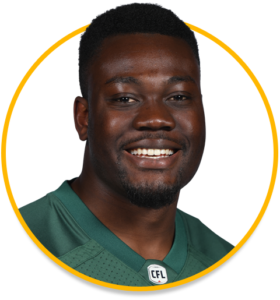 2017: In 18 games (one start), The Green and Gold rookie finished with 22 defensive tackles, four quarterback sacks, and one forced fumble in 18 games played. In the West Semi-Final, Boateng recorded three tackles and appeared in the West Final. College: Wilfrid Laurier’s all-time sack leader, Boateng, was named a 2016 CIS Men’s Football Second Team All-Canadian and is also a two-time Academic All-Canadian.